Our Director, Ange Connor, was recently asked by the Recruitment, Consulting and Staffing Association of Australia & New Zealand (RCSA) to share her thoughts on Reference Checks in their quarterly magazine The Brief. Are you in favour of them and conduct them regularly or are they a thing of the past and no longer needed? Ange shared her opinions along with three other industry professionals and in this week’s blog we share Ange’s thoughts on the value of conducting reference checks. Reference Checks are incredibly important. Contrary to the common opinion “nobody ever puts down someone that will give them a bad reference,” it is surprising how many referees don’t give glowing references. The purpose of reference checking isn’t for the referee to tell you if the candidate will be successful in your role. This is where I think people lose sight of the value of the reference check because they do a reference check, the referee says they were great and you hire them then they turn out not to be great. Was the referee lying? Or did you ask the referee the wrong questions? 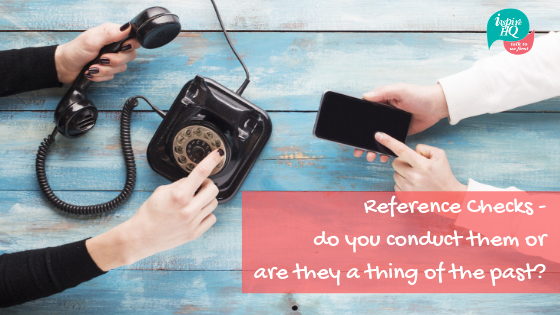 Reference Checking is valuable when we ask the right type of questions and speak with the right person. Preparing specific and relevant questions and understanding what information you want to gather from doing the reference check is key. The purpose of the reference check is to substantiate what you have read in a resume and what you have observed and heard in an interview. The focus should be to gain insight in to the person, their work style, what comes naturally to them and what doesn’t, where they may need support and to then piece that information together with the role you are considering them for. I have observed individuals who has been successful in their role in a particular industry yet when they have changed jobs and gone to a competitor – into the exact same role in the same industry they have failed miserably. Conducting a detailed and comprehensive reference check would highlight that yes this person has been an excellent employee. What should be questioned is what support structure was in place to help that person succeed, what were the processes and systems they needed around them to achieve success and if that is where there is a major gap in what you can offer you need to weigh up if this person will be able to succeed in the new environment. Speaking to the right referee is crucial. Don’t hesitate to question who the referees are that they have provided and suggest to the candidate the referees that you’d like to speak. If they really want the job they will track down the manager referee they have lost contact with or if they are evasive it could be a red flag. We’d love to hear your thoughts. Do you agree with Ange or do you think reference checks are a waste of time and a thing of the past?